A few days ago, my mother came upon a woman in a Facebook group who was collecting donated goods for some families with children who were in desperate need this holiday season. Upon looking at the list, she felt like she could help them out with a good number of items. She contacted me to see if I had anything on the list that I would be able to contribute. Just like most of us, I have plenty of extra things sitting around that, in all honesty, I don’t really need to keep hanging on to. Not only did I have a few things, once I started really looking, I found that I had a lot of things that I could pass on to these other families. Giving away the goods was not the challenge of this act of charity. No, no. Physically handing things over to another person, family, or organization doesn’t take a lot of effort. I found where I really need to learn a lesson in giving and that is in my attitude. 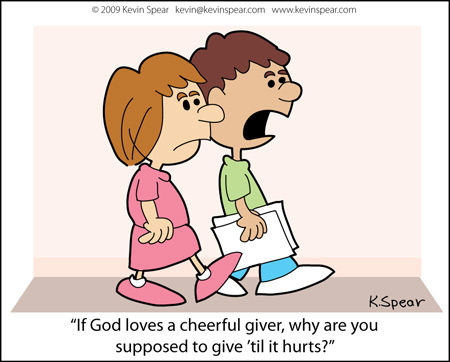 Because, what good are all those items given to another if they aren’t given, as St. Paul says, “cheerfully”? It’s been a week now since the tragedy took place at Sandy Hook Elementary school and I think I have finally gotten my thoughts together enough to write a cohesive blog about it. I’ve been wanting to flush out my feelings on it all – about my outrage, about my sadness, about faith & free will, about the media, etc. There’s been dozens of ideas and trains of thought running through my head and I haven’t been able to put pen to paper (so to speak) about any one of them. I’ve started and stopped writing several blogs because there’s just too much to say about this one event. My family doesn’t hail from the deep South originally. Though we have lived here 30 years or so, neither of my parents nor the oldest 3 of the 5 were born in Alabama. Consequently, pretty much all of our relatives are located in the Northeast – where it snows and is cold in December! Because of the long distance, it was rare in our early lives that we got to spend Christmas with the extended family.